Fred Cain has been in business a long time. 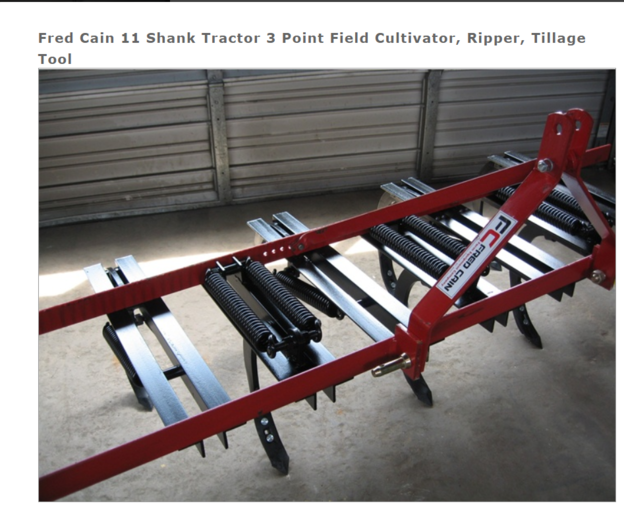 I remember selling new Fred Cain equipment back in the 60's-80's when I was employed by a JD dealer. For just putting in a food plot go with a disc. Add a little weight if you like. Most food plot mixes only call for about 1/4 inch planting depth so you dont need to plow up china. The idea of putting in a food plot for wild animals is foren to us crop farmers that we loose way to buch of what we need to live off of to the animals. I just cannot see why anybody wants to do that as we need less of thos deere rather than more. where at in Mo? I am down in the southeast part(Cape Girardeau County). I use a drag type disc, can set it to really cut good and then set angle for finish discing, then set at slight angle for covering seed. When I grew up in central MN there were a lot of small dairy farms around us. There was lots of tilled acres and even more land that was pastured. The farms are all gone now and most of that land is going back to forest. Back then it was rare to see a deer around. Now they are pretty common. But we still have pretty severe winters here so there is a lot of die off. And the wolves have moved back in so they take a lot of deer. Coyotes too. This year was brutal for the deer herd. Very cold and really deep snow so I suspect the numbers will be down significantly. I do the deer plot thing. Keep a couple of acres planted. It does help to keep a few deer around and it is a couple of acres that won't go back to forest as long as I keep them tilled. In MN only about 37% of deer tags are filled each year. We just don't have the numbers like some of you guys do. Since I've been plotting we are batting about double the state average so it is effective. I'm sure if I was farming I would resent the loss from the deer. so the deer can be drawn in and KILLED so figure that is reducing the number of deer. And I might add it may come as a shock but the whole World does not revolve around grain farmers and their wants and whims. Why try to have more deer to get hit by more cars. And here in Ohio deer harvest is limited to half the new deer born each year to get more deer to have more car wrecks. We have enough of them. Deer populations vary quite a bit, and although they are a nuisance in some aspects, we are fortunate that we have a good balance around here. They don't do much damage to field corn around here, soybeans however are a different story. They will tear up a garden if you don't spray the repellant, which is non-chemical based. Nurseries for trees and Christmas tree farms etc. seem to have trouble with them, and any of the large vegetable kinds of farms may fence them out as well. Benefit for me is that they provide some healthy red meat, and are often around the house which means there likely are no prowlers or anyone around. They browse all kinds of forage and feed on so many different things it's incredible. I had a fawn and he'd chow the leaves off this crazy invasive vine that's been at the corner of my house for years, same with the leaves off this one 20 some odd year old tree, woodchucks like the same leaves off that tree. Food plots in places like we have here are an enjoyable hobby and I often planted one next to a farmers field corn crop in one of my fields. The squirrels and birds did more damage to the yields off that field than anything else. The deer benefit, ones you harvest will have finished on good green forage as they will graze it more than browse, depending on what it is, weather/season etc. Take a section of backstrap, season and then cook on the grill, add a side of potatoes, vegetable, there is no substitute, my freezer is well stocked, takes 3 hours to debone and clean a decent size deer, longer if you clean all the harder muscle groups for the grinder. Canadian geese will totally decimate a corn crop sometimes. There is a great 20 some odd acre field next to me here, local and large grain crop farmer will not plant it anymore, losses were too great, but he also did nothing with the DEC depredation permit. Had he, it would work. Last year they did not have any young and nothing seemed to have been done unless someone oiled the eggs unbeknownst to me. It's my pond actually. They have young and it's a forage fest the whole summer, the crop may not get off the ground, all depends on the conditions, sometimes it overcomes the geese, other times not. late Spring and Summer,then late planted soybeans into the Fall along with corn.